BICC Publications/BICC’s Global Militarization Index (GMI) 2013: Factsheet. You are here: Home » Publications » BICC’s Global Militarization Index (GMI) 2013: Factsheet. 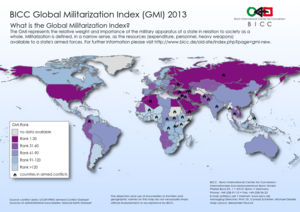 BICC’s Global Militarization Index (GMI) 2013: Factsheet.